July 20, 1969 Neil Armstrong became the first person to walk on the moon and his home town of Wapakoneta is planning a big celebration this summer for the 50th anniversary. Greg Brown, Experience Coordinator at the Armstrong Air & Space Museum told us that the Summer Moon Festival from July 19-21 will feature at least three astronauts, exhibits from NASA, inflatables, games, entertainment and much more. Phase 1 of the museum's renovation will be complete by then, adding 1,600 square feet of classroom space so the museum can expand its educational offerings. Phase 2 of the expansion will include additional exhibit space and is expected to be completed by the summer of 2022, in time for the 50th anniversary of the museum's opening. Brown said they also plan to renovate the Astro Theater so it will be a working planetarium. Brown says the Armstrong Air & Space Museum is a monument to Ohio’s contribution to aviation and space exploration from the early pioneer days through the space shuttle era. 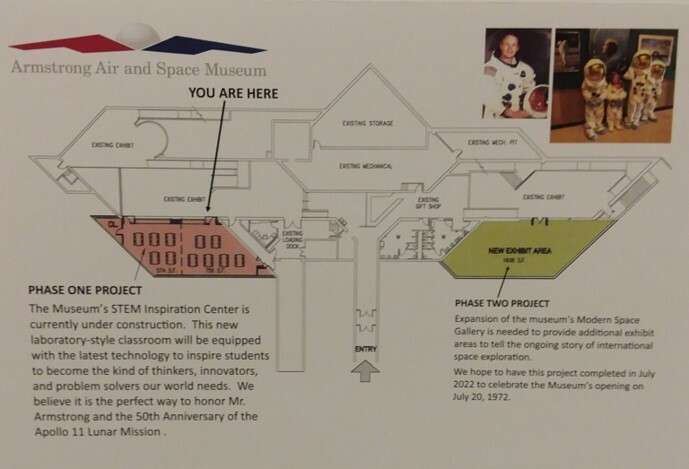 Exhibits include a moon rock Armstrong brought back with him, two full-sized aircraft he flew, the Gemini VIII space capsule, artifacts from the Apollo 11 mission and more. Also at Monday's meeting, Lima Rescue Mission Director Chuck Ferguson updated us on the organization's mission. They provide shelter and food for homeless men on a temporary basis and transitional housing for men with some income, but not enough to afford a place of their own. periods of time. The mission also operates Camp Roberts, a summer day camp for children in grades K-6 who attend Lima City Schools.